Other names: Batoka plum, Mududwe, Munhunguru, Mutombototo, Mutudza, Mutunguru. 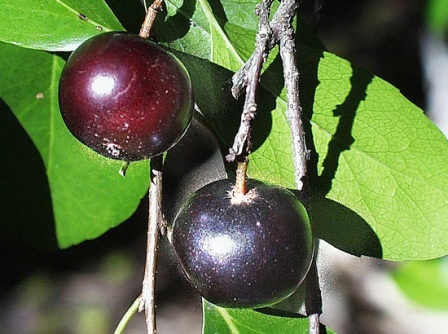 Governor’s Plum is a large shrub or small tree native to tropical Africa. It is found from Tropical Africa south to northern South Africa, Swaziland; Madagascar, India, Sri Lanka, Indo-china, Indonesia and China. This fruit is cultivated in tropical regions as a hedge plant and for its deep red acid fruits resembling small plums. 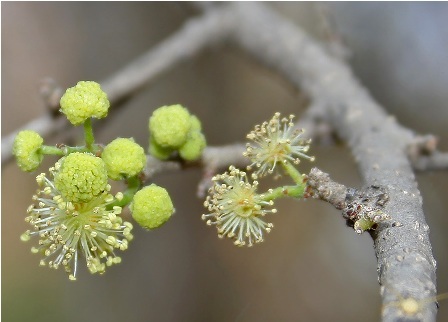 A spiny shrub or small tree, up to 10 m tall; bark rough; spines of the trunk sometimes branched, up to 12 cm long; vegetative parts varying from glabrous to densely pubescent. Leaves also variable in shape and size; blade ovate or elliptic, sometimes suborbicular or obovate, apex obtusely acuminate, obtuse or rounded, base cuneate to rounded, membranous to almost coriaceous, serrulate-crenate, or more rarely subentire, 2.5-12 cm long, 2-8 cm broad; lateral nerves 4-7 pairs, slightly prominent on both faces, as is the more or less dense reticulation; petiole up to 2 cm long. Flowers dioecious, or occasionally bisexual; male flowers in axillary racemes, 0.5-2 cm long; pedicles slender, more or less pubescent, up to 1 cm long, the basal bracts minute and caducous; sepals broadly ovate, apex acute to rounded, pubescent on both sides, 1.5-2.5 mm long and broad; filaments 2-2.5 mm long, anthers 0.5 mm long, disk lobulate; female flowers in short racemes or solitary; pedicels up to 5 mm, disk lobulate, clasping the base of the ovoid ovary; styles 4-8, central, connate at the base, spreading, up to 1.5 mm long; stigmas truncate. Fruit globular, reddish to reddish black when ripe, fleshy, up to 2.5 cm across, style persistent. Seeds, 2-10, 8-10 mm long, 4-7 mm broad; testa rugose, pale brown. Ripe fruits of governor’s plum are good to eat. Their taste resembles that of European plum but is slightly more acid and a little bitter too. The fruits are also rich in pectin and therefore quite suitable for processing as a jam or jelly. The fruits are also sold in market at many places. 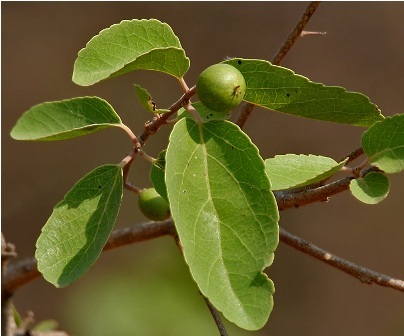 Governor plum tree has many uses in medicine, particularly in Zimbabwe. 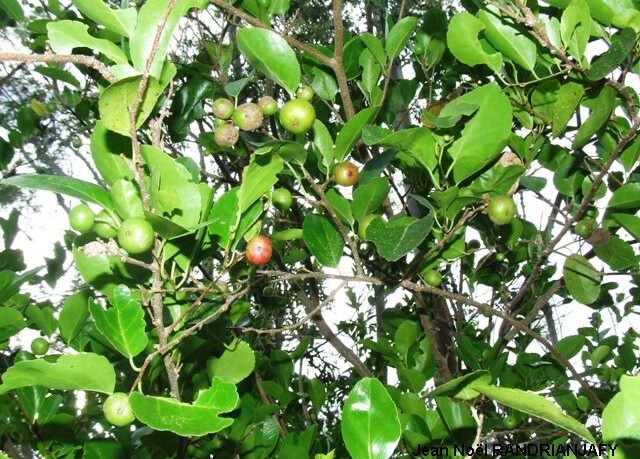 The fruits are used for jaundice and enlarged spleens. The leaves and roots are taken for schistosomiasis, malaria, and diarrhea The roots are used for hoarseness, pneumonia, intestinal worms and as an astringent, diuretic, and pain reliever. This plant is very easy to grow and does not require any special car. However, the plant has to be pruned for getting the desired shape if it is to be planted as a hedge. There are no distinct varieties except one which has no thorns. The plants are quite attractive and look good as hedge.